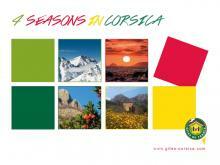 Dreaming of heavenly Corsican beach holidays? Welcome to paradise, in the form of the glorious Palombaggia beaches. For basking in the sun or swimming in the sparkling sea, nowhere could be better than Palombaggia, which boasts some of the finest beaches in all Corsica. With Gites Corsica it’s simple to organise Corsican beach holidays in this idyllic environment: we offer an exceptional choice of carefully selected, quality-guaranteed accommodation, from independent family gites to charming bed & breakfasts, some including the option of traditional “table d'hôte” meals with your hosts. Stay for a weekend or spend your summer holidays with us, keep things simple or vacation in luxury: our Corsican beach holidays offering is varied enough to suit all tastes, schedules and budgets. Whatever your choice, Gites Corsica is committed to ensuring your holiday experience in these beautiful surroundings is truly unforgettable.